I've been blogging (definitely not consistently) for about 4 years now. In the past year or two, I've really started to do a lot more scrapbooking and play with my collection of scrapbooking items. This is due in BIG part to finally having a dedicated corner where I can leave all my scrapbooking supplies out and a closet to organize everything. Realizing how much fun I have creating pages, albums and crafts, I want to do this all the time! My newest goal is to be on a design team, sharing my pages and crafts. 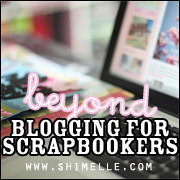 I found a class called "Blogging for Scrapbookers" by Shimelle and am really looking forward to learning more about blogging my scrapbooking. 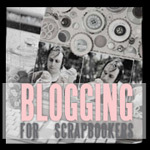 I follow many scrapbookers' blogs and would love to do what they do by sharing their pages and crafts with more than just a picture. I struggle with knowing what to write on the blog and I am wondering how to take a pictures without all my clutter in the background. I hope that all the things I learn will help me on my journey to be a better scrapbooker and *fingers crossed* to be on a design team someday! If anyone in the class is reading this - Hi! Can't wait to learn together!